In Aireon’s blog series, ‘Back-to-Basics’, 1090 Global is breaking down the complexity of the AireonSM system into simpler terms. Though they know that not everyone is a satellite engineer or an air traffic controller, they can assure us that it is not all rocket science! We are sharing their series because it helps us raise awareness on aviation safety and highlights an example of the technologies that help to support international air connectivity. This is the first of Aireon’s two part series. When you operate in a world filled with acronyms and highly technical terms, it can sometimes feel like you are diving into a big bowl of alphabet soup. We know that in order to fully understand Aireon, it’s helpful to understand the “jargon” that comes with the industry. With that in mind, we have compiled a beginner’s guide to the Aireon system, Iridium® NEXT satellites, ADS-B and more. You are welcome to keep this guide handy in the event you need clarity on the many acronyms and terms we use on a daily basis. Below you will find several of the most commonly used acronyms and terms when reading and speaking about Aireon and the aviation world in general. The following guide only scratches the surface but should provide a solid foundation. ADS-B is a surveillance technique that relies on aircraft broadcasting their identity, a precise GPS position, altitude and velocity. The signal is broadcast through line-fit antennas that send the information every second. It is “automatic” because no work is required from the pilot or Air Traffic Controller to broadcast the signal. It is dependent because it relies on on-board avionics to provide surveillance information to other parties. Aireon will provide the first global air traffic surveillance system using a space-based ADS-B network that makes it possible to extend visibility across the entire planet. Essentially, rather than relying on ground-based infrastructure to track aircraft, Aireon is taking that capability to space by placing its technology (ADS-B receivers) on board the only truly global satellite constellation, Iridium NEXT. These receivers will relay signals from all ADS-B equipped aircraft to controllers worldwide. 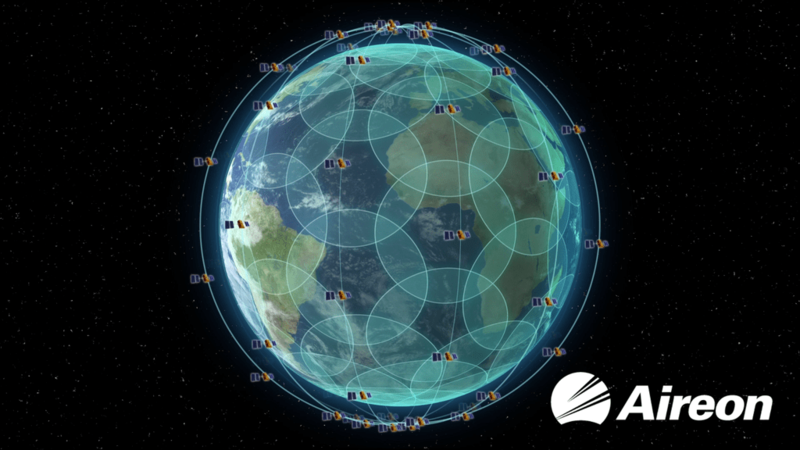 Since this is a space-based network and requires no local, ground-based infrastructure, Aireon will deliver the first ever technology that can provide on-going tracking of aircraft over oceans in real-time, and the 80+ percent of the world’s Flight Information Regions (FIRs) currently not covered by any real-time surveillance. Iridium NEXT, the constellation hosting the above-mentioned Aireon ADS-B receivers, is located in low Earth orbit. As indicated by its name, this orbit is in closer proximity to Earth than other orbits, such as geostationary orbits. The Iridium NEXT constellation is approximately 483 miles above earth. The LEO altitude allows aircraft ADS-B signals to be received in space without any additional equipment or changes to existing aircraft avionics. It also allows for a shorter transmission path, strong signals and lower latency. Each individual satellite within the Iridium NEXT constellation is referred to as an SV (satellite vehicle). 66 SVs make up the operational constellation. Each Iridium NEXT satellite is linked to its surrounding Iridium satellites – in front, behind, to the left and the right – creating a dynamic meshed network that routes traffic through each other. This is made possible through its crosslinks (picture the satellites holding hands with each other and following their own “buddy system”). Since Aireon’s technology is hitching a ride to LEO on every Iridium NEXT satellite, the technical term for this relationship is a “hosted payload”. The Aireon technology is the payload, which is being hosted on each Iridium NEXT satellite. Each AHP transfers aircraft data from satellite to satellite down to Iridium’s Teleport Network (TPN) and Aireon Processing Distribution (APD) system. This is the first stop on earth for Aireon data. It’s the transfer point between the AHP and the Hosted Payload Operations Center (see below). This is where the health and status of the AHPs are monitored. Command and control operations take place here as well, including the delivery of mission data to Aireon Processing and Distribution (see below). Once the data arrives here from the HPOC, it is decoded and verified before being delivered to its appropriate stakeholder facility that has subscribed to the Aireon service. Working in tandem with APD, the ANOC delivers ADS-B reports to subscribers, monitoring major system applications and assets, and monitors and compiles key payload performance data. This is the demarcation point of Aireon’s data – where the data reaches the end customer’s service point. This is the Iridium facility where the satellite network command and control efforts take place, as well as where health monitoring and performance testing and validation processes occur. It is also the location of Aireon’s HPOC. ANSPs are organizations that manage air traffic on behalf of a region or country. Not all ANSPs are alike, but they all are responsible for providing Air Navigation Services, including air traffic management, search and rescue surveillance and more to its designated region of operation. In relation to Aireon, ANSPs are all potential customers of Aireon. The data delivered by the Aireon system has the potential to vastly improve their operational efficiency, increase safety and effectiveness without requiring significant new infrastructure investment on the part of the ANSP. A FIR is a specified region of airspace that provides flight information and alerting services. FIRs are managed by ANSPs and provide clear borders and boundaries for airspace control and organization. A United Nations specialized agency that was founded in 1944 to manage the administration and governance of the Convention of International Civil Aviation (Chicago Convention). Today, ICAO works with the Convention’s 192 Member States and industry groups to reach consensus on international civil aviation Standards and Recommended Practices (SARPs) and policies in support of a safe, efficient, secure, economically sustainable and environmentally responsible civil aviation sector (source: www.ICAO.int). This will be the industry’s first and only free global, real-time emergency aircraft location service. ANSPs, aircraft operators, regulators and search and rescue organizations in need of crucial aircraft location data, can rely on Aireon ALERT to help provide an aircraft’s most recently known position. It will fill a critical need, ensuring search and rescue personnel have the most accurate aircraft position data available when responding to an incident, regardless of global location. The service will utilize Aireon’s space-based ADS-B data and will be operated by the Irish Aviation Authority (IAA).